Your child is growing up too quickly, and you can’t believe he’s a 4-year-old. He is outgrowing the typical toddler toys and wants to be more like the “big kids”. You’re not ready for that, and you’re not quite sure if he is either. How do you decide on a gift for this growing boy? There are so many options for boy toys out there; how do you decide what is right for your boy? 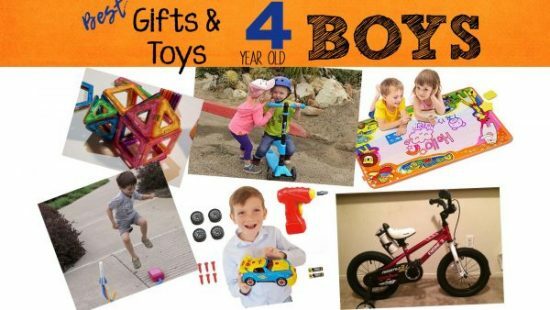 We have reviewed what we have found to be the best gifts and toys for 4-year-old boys. 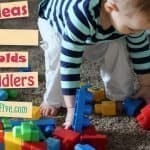 They are broken down into 4 categories: Creative Toys, Active Toys, STEM/Learning Toys, Imaginative Play Toys. 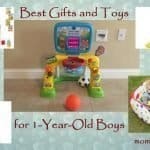 These gifts and toys are high quality and proven to be loved by 4-year-old boys. So, embrace this great stage of life and find your boy the perfect gift! 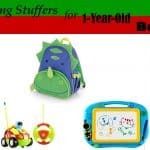 These toys will help your young son prepare for preschool or kindergarten by letting them use their creative brains. Does your child like to paint? Do you love the mess that comes with your child painting? If you don’t love the mess, this is the toy for you (and your child). 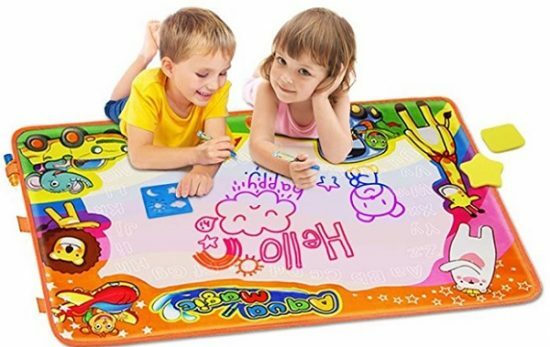 The Betheaces Water Doodle Mat allows your child to paint without the mess of actual paint. Simply fill the included pen or brush with water and paint onto the mat. Color appears magically! Then, when your child is finished, simply let the mat dry. The colors will disappear within about 10 minutes, and the mat is ready to use again. No mess to clean up, no stained clothing, no paper. This mat can be used on any solid surface–a floor, table or counter top work fine. It can even be used outdoors. The back of the mat is made of water-resistant nylon so whatever surface is under the mat won’t get wet. Once dry, the mat can be folded up for easy storage. The mat comes with 1 pen and 1 brush as well as 4 sets of stencils, a drawing template, and a drawing booklet. Everything is non-toxic, and the mat is eco-friendly. Be aware that the pen and brush are labeled incorrectly. You have to turn it in the opposite direction of the label in order to open the pens. It is also helpful to wet the brush tip before the first use. Drawing can be hard and a bit frustrating for a 4-year-old. With a stencil kit, kids can easily draw what they want without all the tears or asking you for help. This stencil kit is large and loaded with stencils. Included are 14 large plastic stencils containing over 280 shapes. From animals to flowers to transportation to the alphabet, your child is sure to find something he enjoys drawing. Also included are 14 colored pencils with a sharpener. Plastic clips help keep the paper and stencils in place as your little artist traces. There are 22 paper sheets in this kit, though you can use any paper with these stencils. The heavy-duty storage case holds all supplies. 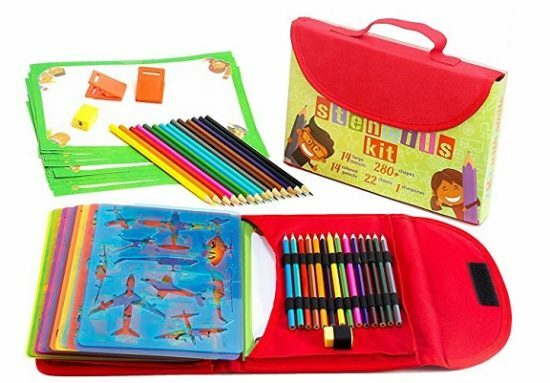 It even has one hard side that can be used for drawing, which makes it perfect for travel. I love that this quiet toy can be used in such a wide variety of places, whether it’s the park, his bedroom, church, the car, or anywhere else. Your child can trace the stencil images and then color them to his liking. All products in this kit are BPA-free. Art with a Smile offers a 1-year warranty with this product. 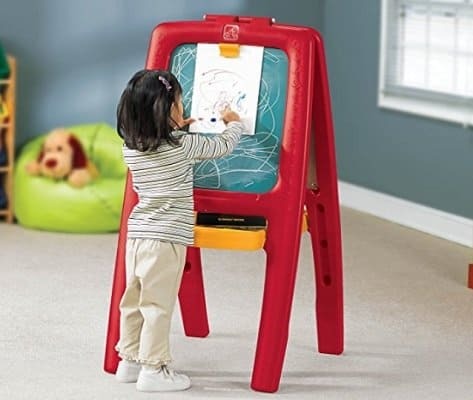 Your budding artist will love the Step2 Easel for Two. This heavy-duty, high quality plastic easel works for drawing or painting. It is at a height that is good for most 4-year-olds, with room to grow. On one side of the easel is a chalkboard, and on the other side is a magnetic whiteboard. The easel comes with 77 foam magnets including uppercase letters, numbers, and symbols. You can also write with dry erase markers on the whiteboard. There are clips on each side of the easel to hold art paper while your child paints or draws. Each side also has a tray to hold art supplies. These trays are plenty wide and deep enough to hold any needed supplies, including paints and water. When not in use, the Step2 Easel for Two easily folds for convenient storage. Art supplies are not included with this easel. Kids love playing with PlayDoh, but a lot of parents aren’t big fans. It dries up easily and makes a mess. Enter Educational Insights Playfoam. This soft, shapeable foam never dries out. You heard me right. It doesn’t dry out!! You don’t even have to put a lid on it. These beads hold their shape well and are easy to use. Even better–it doesn’t stick to anything. The texture is fun and different; kids and adults enjoy squishing the beads through their fingers. Playfoam can be made into an endless number of shapes and creations. This set comes with 13 double-sided cards containing all the capital letters. 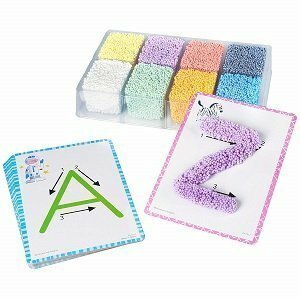 Your child can use the letter cards to guide him in shaping the foam into letters. What a great combination of fine motor skills, cognition, and creativity! Also included in this set are 8 bricks of Playfoam, each in a different color. The Playfoam is non-toxic. Who doesn’t love a magnetic drawing board? 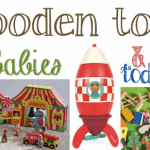 This classic toy is timeless and so much fun for kids of all ages. For a 4-year-old who is just learning to draw and write, it can be magical. This isn’t the old magnetic drawing board from your childhood. No more plain black lines or shaking the board to erase. 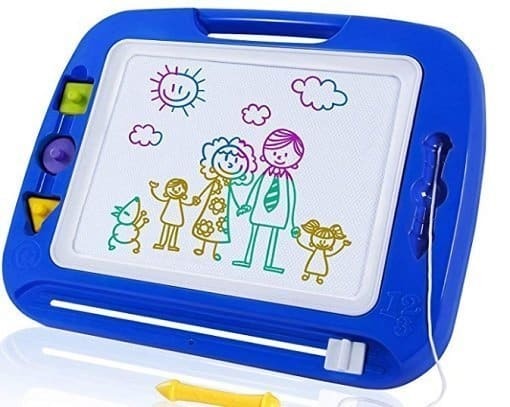 Instead, the SGILE Magnetic Drawing Board uses 4 different colors to make pictures and words come to life. Erasing is easy–simply slide the tab across the bottom and everything disappears. Another big bonus: this board is bigger than most magnetic drawing boards. At 13″ x 16″, it is the just the right size. It is a good option to use during any quiet time–on a plane, in the car, at church, at home or anywhere else. Lightweight and portable, it couldn’t be easier. There are two options with this board. You can choose the basic board with the stylus. Or, for slightly more money you can get a foldable stand and three stamps (a square, a circle, and a triangle). I was first introduced to dot markers when my daughter was in preschool, and I have come to love them. I bought a set to use at home, and my kids have really enjoyed using them. Dot markers are kind of a combination of a marker, a stamp, and paint. However, a dot marker is so much less messy (but not totally mess-free) than regular markers, stamps, or paint. All the ink is inside the dauber stick. Simply dab the tip of the dot marker onto the paper and a colorful circle appears. This is great for kids who are learning to color inside the lines or just to have some fun. It also helps kids learn colors and counting. 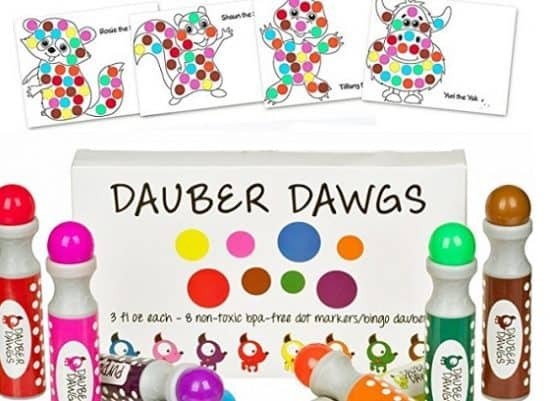 The Dauber Dawgs Kids pack comes with 8 washable dot markers (yes, washable! Hooray!) in 8 different colors. It also comes with 10 coloring pages. In addition, you get 4 downloadable activity books with 100 pages of pictures and activities you can print. Your 4-year-old wants to keep moving, and what better way than with a beginner scooter? 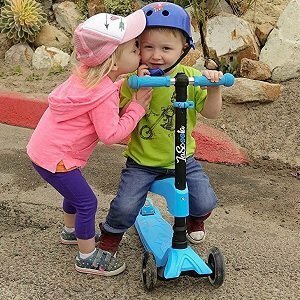 LaScoota’s 2-in-1 Kick Scooter with Removable Seat is perfect for young kids. It gives the option of either sitting or standing, which is nice for kids just getting the hang of it. They can start by sitting and having a parent push them. Then, when they are ready, easily remove the seat (using the included allen wrench) and let them try pushing with their feet. 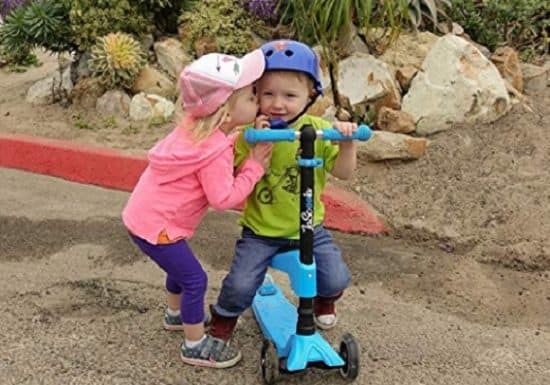 Not only is this a great beginner scooter, it also grows with your child. The handlebar has 4 different height option, and the scooter is made for kids up to 130 pounds. This means you can get many years out of this scooter, and I know I’m not the only one who loves that idea. Made of aluminum alloy and stainless steel, the LaScoota is sure to wear well. Riding on 3 wheels makes it easier for young kids to learn balance and coordination. Additionally, this option has an extra wide deck, another bonus to help a learning child. One of the favorite features is flashing lights on the wheels that light up when the wheels turn. And to make it even more appealing, it uses no batteries. Instead, built-in magnets cause the lights to turn on. The handlebars on this scooter don’t turn. Instead, tilt the handlebars in the direction you want to turn, and you will go that way. Kids seem to get a hang of turning pretty easily with this LaScoota. To stop the scooter, simply push down on the brake located on the back wheel. 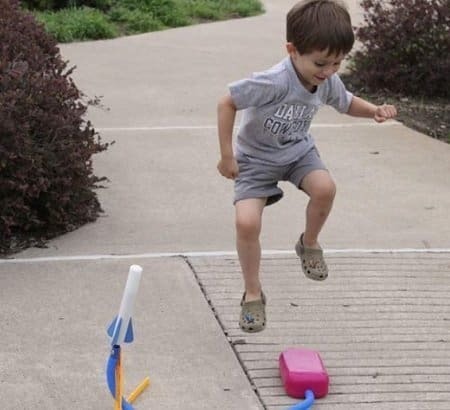 A 4-year-old boy is often a ball of energy, and Stomp Rocket Jr. is a safe and fun way to release some of that energy. Simply place one of the foams rocket on the plastic stand. Then have your boy jump on the launching pad. He will love watching the rocket soar up to 100 feet in the air. With four rockets included, your boy can keep jumping and launching without having to collect his rocket after each jump. The rockets are glow in the dark, which adds another fun element. This toy, while simple, affords hours of fun and active play. I love that it is easy enough for a 4-year-old to place the rocket and launch it without help. Initial set up is simple, and if shown how, your 4-year-old could even set it up himself. 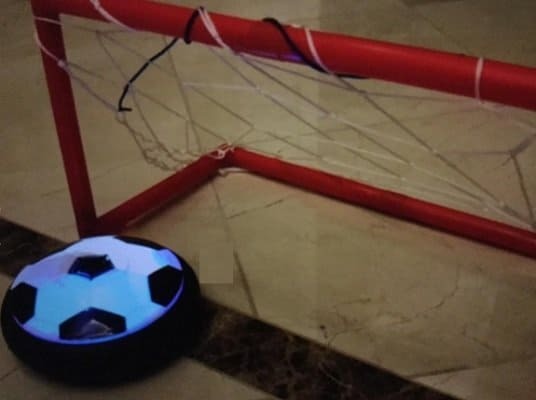 Hover soccer balls are a current trending toy. Rather than an actual ball, this is a flat disc with a soccer ball picture on it. The game itself is like air hockey on the floor. You kick the soccer disc and try to get it into one of the two portable goals. This game can be played on any hard surface, and it won’t damage your floors. The sides of the disc are made of foam, so you don’t have to worry about your walls being damaged, either. To make it even more fun, the disc is lit by LED lights. Kids of all ages love this toy, and it is a great choice for your 4-year-old. I like that this game can be played indoors, so weather won’t be a factor. It is a fun game to play with other players or alone. The manufacturer offers a 1-year warranty and a money back guarantee. This is a great addition to your arsenal of non-electronic toys. The Little Tikes TotSports T-Ball Set is sure to keep your kiddo entertained. Not only is it fun to play with, but it also improves motor skills, hand-eye coordination, and coordination skills in general. 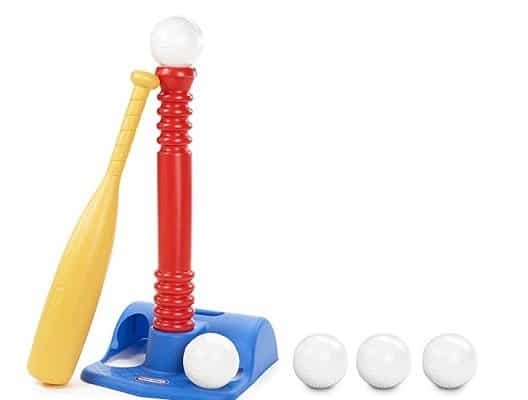 I like that this is a basic t-ball setup, but it is the high-quality you would expect from Little Tikes and will last. The tee itself is adjustable, so it can be raised or lowered depending on your child’s height. Then as he grows, you can raise the tee. Besides the hard plastic tee, this set comes with an oversize plastic bat and 5 oversize plastic baseballs. These are hard plastic, so they won’t dent and they won’t warp in the sun. I love that they are oversize because that means it is easier for kids to get the hang of hitting the ball with the bat. Then they become confident and excited instead of deflated and discouraged. The Little Tikes tee is lightweight, but it stays upright when the ball is hit. The base of the tee stores 2 balls. It would be nicer if all 5 balls could be stored in the tee. With this set, you have the option of hanging it on the wall to store it. This is a good toy to play alone or with a friend. It can help encourage turn taking and cheering on someone else. To find a little league tee-ball team near you, check out the Little League Baseball organization. When I was a kid, my cousin fell off his pogo stick and knocked out two of his teeth. It made me terrified of pogo sticks. Fast-forward a *few* years, and now my views have changed. All because of the My First Flybar Foam Pogo Jumper. 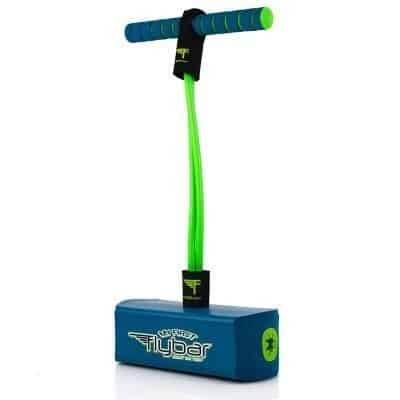 This foam and bungee cord pogo jumper is safe and so fun to use. Rather than a solid stick in the middle, it has stretchy bungee cords. These cords allow the user to pull the handles up and down, helping facilitate a jump. The base is made of foam, which compresses as the jumper pushes down to jump. Will this toy give you as high a jump as a regular pogo stick? Probably not, but it is a safer, still fun way of jumping. You can do tiny hops or larger jumps. This jumper has a weight capacity of 250 pounds, so even adults can try it. It comes in three color options (orange/red, green/blue, and pink). Learning to ride a bike is a rite of passage, and age 4 is a great age for most kids to start riding a bike. The RoyalBaby BMX Freestyle bike is big kid bike in miniature. It comes with a quality, sturdy frame as well as 2.4″ wide pneumatic rubber tires with custom tread. These tires are heavy duty and will not pop easily. Training wheels and both front hand brake and rear coaster brakes will help your boy learn to ride. A chain guard helps keep small fingers from getting hurt and keeps the chain from coming off. I know what you’re thinking: how long will it take to assemble this bike? You are going to love this answer. It comes 95% assembled. All you have to do is put on the training wheels, pedals, handlebar, and seat. The tools you need are all included. This is a very durable, high-quality bike. 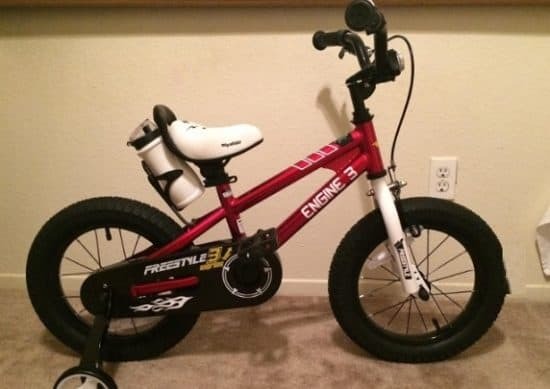 While it is a little more expensive than generic bikes available at discount stores, the RoyalBaby BMX Freestyle bike is superior. It will last through several children. This bike comes in 6 different colors and 5 different sizes. We are always looking for family bonding activities, and one of the best ones we have found is fishing. It allows us to unplug, enjoy nature, and relax a bit. I used to be nervous about taking my young kids out on adventures, but I found it is worth the extra effort. Fishing can be a great experience even for young kids who are just learning, provided they have the right gear. The Shakespeare Youth Fishing Kit is a fun all-in-one character fishing pole. There are many options to choose from including Tinkerbell, Frozen, Barbie, Mickey Mouse, Cars, Avengers, and several others. It is pre-spooled with very basic line. The rod measures 2’6″. While this is not the highest quality pole, it is a good one to get your young child excited about fishing and to teach him the basics of fishing. It comes with a rubber fish to help kids practice casting. This is for right-handed anglers (the reel is not reversible for lefties). Nothing stimulates a child’s brain like a STEM or learning toy. Starting kids early with these types of toys gets them excited about learning and helps their brains develop more quickly. 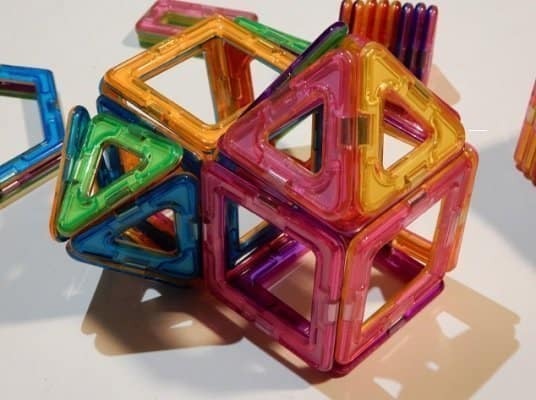 These toys help with cognition, dexterity, creativity, problem-solving, following directions, and understanding the world. Four-years-old is a good age to beginning learning to write, and LeapFrog Scribble and Write makes it easy. 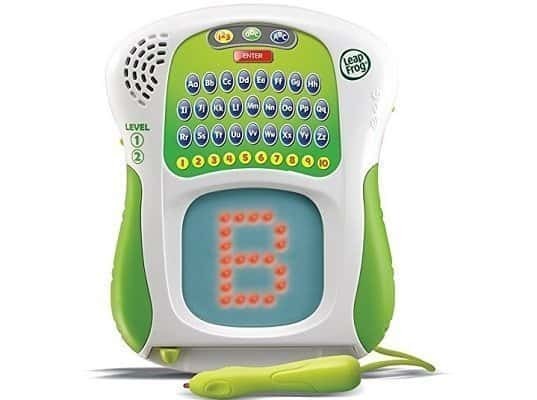 This portable writing tablet helps kids learn to recognize and write letters A-Z (both uppercase and lowercase) and numbers 1-10.
Letters and numbers show up on the screen, and the child uses the stylus to trace each letter. Lights show where to start and how to form each letter or number. Since learning to write takes significant practice, the LeapFrog Scribble and Write has two different levels. The first level is for scribbling and getting used to the stylus. Once the child is ready, he can move on to the second level. This level focuses on accuracy. It gives instant feedback, helping the child learn the proper writing stroke. In addition to teaching writing, the Scribble and Write has some fun activities as well. 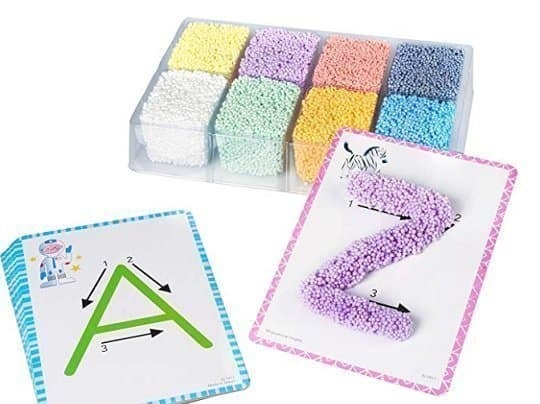 These activities help with visual letter recognition, hand-eye coordination, and letter sounds. Basically, this toy will have your child well on his way to being ready for kindergarten. 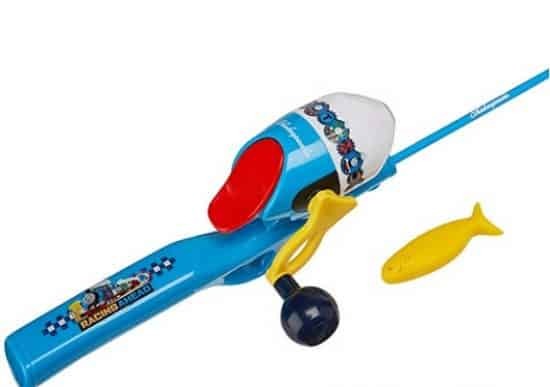 This toy can be used by both left-handed or right-handed users. It helps with dexterity, accuracy, and control. Kids are full of so many questions about everything they can think up. Sometimes it gets tiring answering those “why” questions, which you know will be followed by at least 10 more. National Geographic has you covered, though. 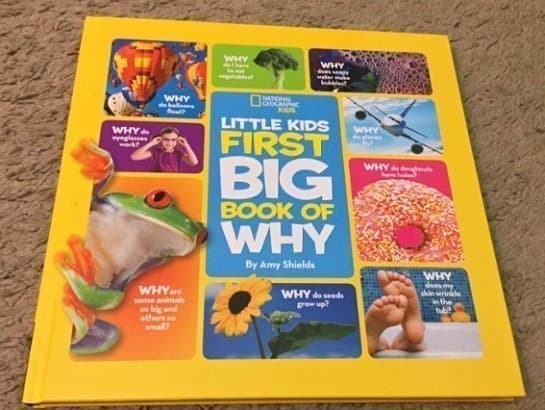 In the book “Little Kids First Big Book of Why”, there are answers to all sorts of questions. It covers why a soft ball of dough turns into a delicious, crispy cookie while it bakes. Your little inquisitive 4-year-old will also learn what makes a car go, why soapy water makes bubbles, why worms come out after it rains, and dozens of other fun facts. I guarantee you will also learn a thing or two as you read this book to your child. This book contains 128 pages full of useful information as well as hundreds of beautiful photographs. You will love that this is a hardback book, and the price is so affordable (under $15)! Most kids love building sets. There is something about putting pieces together to make something new that excites little minds. This building block set is a good choice for a 4-year-old, as it will continue to entertain and challenge him as he grows. The ETI Construction Engineering Building Blocks set comes with 101 pieces of non-toxic, BPA-free plastic pieces. The pieces include 4 block bases to screw other pieces into, rectangular pieces, wheels, washers, screws, and wrenches. All pieces come in a plastic storage tote, which you can keep to store all items. The only issue with the storage tote is that all pieces have to be put back in a specific way or they will not all fit. However, your child can learn organizational skills as he puts the pieces away. This toy comes with an instruction book containing 12 different designs including trucks, robots, transformers, helicopters, and more. One nice thing is that the instruction book breaks down designs into easy, intermediate, and advanced levels. Your child can start out easy and then progress as his skills and attention span increase. He can also come up with his own creations. I like that this toy fine motor skills and hand-eye coordination. It also helps kids follow instructions, make a plan, and organize the pieces. This toy can help kids learn to share and also to work together. 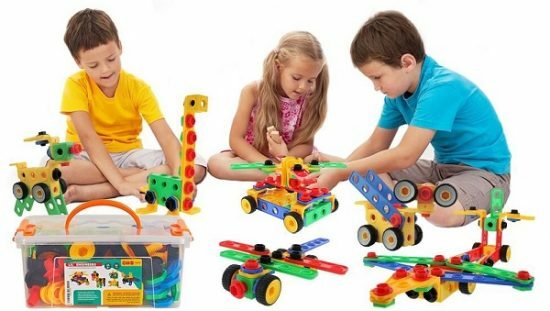 ETI Toys offers a 100% money back guarantee if you are not fully satisfied with this toy. I haven’t met a kid who doesn’t love magnetic blocks. There are also several adults I know who enjoy playing with them as well (2 of them live in my house). If you haven’t seen magnetic blocks before, they are colorful flat magnets in different shapes (squares, triangles, hexagons). They can be put together to form a variety of structures, vehicles, and other designs. This set by Dreambuilder comes with 40 high-quality magnetic pieces in square and triangle shapes. It comes with a booklet showing you how to make several different creations. I love that these pieces can be used to make so many different creations. One of my favorite things is that clean-up is so easy with this toy. Just pick up one piece, hold it over some of the others, and voila, clean-up is done! 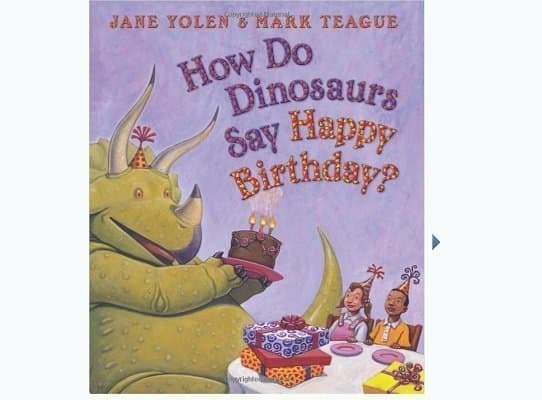 The “How Do Dinosaurs” series is one of my favorite children’s book series out there. It is a favorite of my children as well. I love that each of these books teaches manners in a fun and exciting way. There is humor throughout as the reader watches what a dinosaur might do at a birthday party. This book is almost entirely made up of questions, which is perfect for reading with a 4-year-old. The child can answer each question as it is read. This allows the child to think about what would be the appropriate way to act in each situation. It also gives the reader the chance to discuss each question with the child. A book like this which gives so much opportunity for interaction is a bonding tool as well. Colorful, exciting photos bring the words to life and help the child visualize the events in the story. This inexpensive book is 12 pages long and comes either as a board book or as a hardback book. I don’t know about your boy, but mine loves to catch bugs and put them in a jar. Then the bugs end up on my kitchen counter so he can “watch” them. It’s not my favorite thing, so I was excited when I found the Backyard Exploration Critter Case. 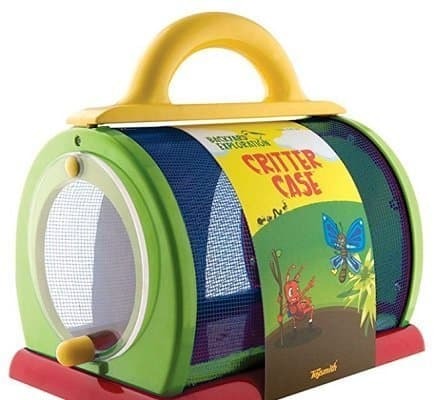 Your child will have a great time catching bugs and putting them in this case. Then he can get a closer look at the bugs and watch them move around. This case would be great for everyday play or even for keeping a caterpillar, watching him build his cocoon, and finally seeing him emerge as a butterfly. What a hands-on science experience this toy provides! This case has a plastic frame with mesh sides as well as a plastic carrying handle. The hatch door is made of plastic and opens and closes easily to insert plants and bugs. A flat base keeps the case from being tipped over. My kids have inherited my love for jigsaw puzzles. We have introduced each of our kids to jigsaw puzzles pretty early on, and they all have really loved putting puzzles together. Something about figuring out where things go helps the brain learn to sort and categorize, which is an important lesson for young minds to learn. Wooden puzzles are my favorite for young kids because they hold up so much better than cardboard puzzles. My mom still has wooden puzzles I played with as a kid, and they are still in good condition after dozens of kids have played with them. Melissa & Doug Vehicles 4-in-1 Wooden Jigsaw Puzzles are excellent quality. 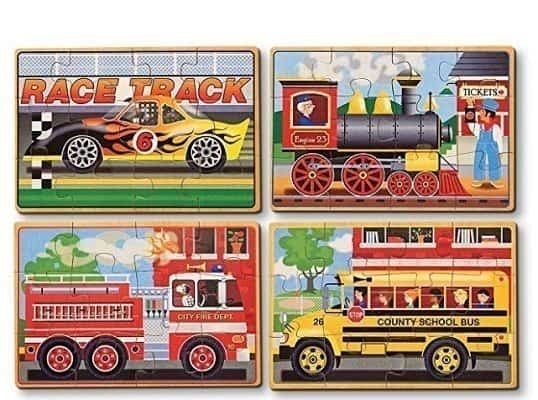 The puzzles include a race car, a school bus, a train, and a fire engine. Each puzzle contains 12 pieces. Many puzzles for younger children contain a picture of the finished puzzle on the bottom of the puzzle board so kids can see where each piece goes. However, this set is more challenging because it does not have those guide pictures. That makes it perfect for a 4-year-old. This set comes with a sturdy wooden storage box which doubles as a puzzle board. Inside the box are four separate squares to keep the pieces of each puzzle. This keeps all the pieces together in one place (Hooray)! What’s even better than toy cars? How about a giant truck to carry them? The WolVol Transport Car Carrier Truck is a plastic 6-wheel semi truck that can carry up to 28 cars. The toy itself comes with 6 cars as well as construction cones, signs, and barrels. Most Matchbox and Hot Wheels cars will fit in this truck. The front of the cab is detachable and can be played with separately. However, the cab can be difficult to detach; you have to pull pretty hard to separate it from the rest of the truck. It would probably be hard for your 4-year-old to get the cab detached without help. 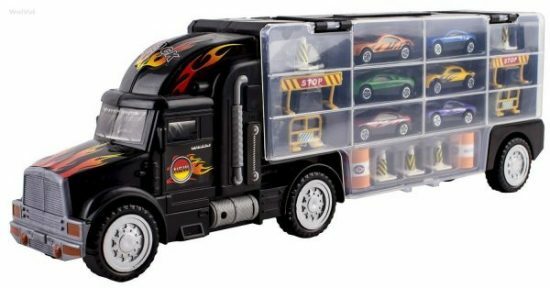 The truck comes with a carrying handle on top, and the toy is pretty light, even when full of cars. Your child should be able to carry it around pretty easily. Sometimes kids don’t love cleaning up their toys (unless my kids are the only ones). This truck makes cleaning up fun and easy, and you won’t have to nag your child to put his cars away. A night light is a staple for a lot of young (and some older) kids. But a night light doesn’t have to be boring. The Jozo Star Projector Night Light provides more than just a night light; it gives a new imaginative experience every night. 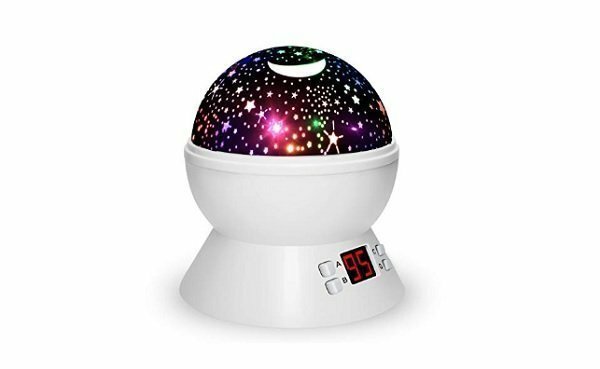 This star projector dome night light projects stars, moon, and planets on the walls and ceiling of a child’s room. It rotates, making the objects rotate as well. Imagine the star show at a planetarium–it’s almost like that. Not only is this great as a night light, but kids love to take it in a dark place and play. It’s a perfect backdrop for sparking imagination. Four different color options (soft white, red, blue, and green) make for an even more fun experience. Choose either just one color or multiple colors. You can choose either the star projector or a plain soft white night light. One of the best features of this light is the option for a timed shutdown. In other words, you can program it to turn off after your child falls asleep. Or, if you prefer, you can set it to stay on all night long. There are two power options with this light, DC power supply or 4 AAA batteries. I find this especially appealing because I get tired of dealing with batteries. Here is the perfect toy for a budding mechanic or pit crew member. 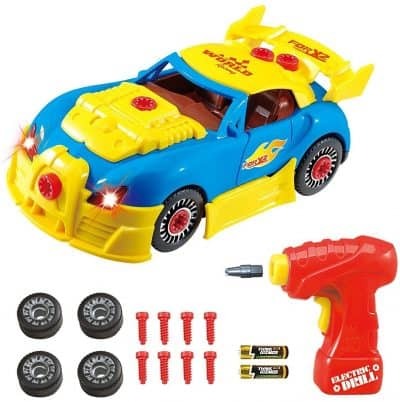 The Mr.Fix.it Race Car Toy allows the user to take the car apart and put it back together. The battery-operated drill is used to remove the screws. This teaches dexterity, control, and eye-hand coordination. The pieces of the car are removable as well down to the frame. All pieces are the right size for small hands to manipulate without frustration. Your 4-year-old can also use his imagination as the lights and sounds of this car make it seem real. The engine makes noise, and the headlights turn on. Your boy can pretend he is working on a real car. The only concern I have with this toy is that the pieces could easily be lost, but if you are careful in ensuring it gets cleaned up every time it is played with, that won’t be a problem. The Mr.Fix.it Race Car Toy requires 2 AA batteries, which are not included. Since I have mostly boys, I didn’t think we would have many dress up clothes, but I was wrong. My boys have liked dressing up more than their sister ever did. And it’s not just cowboys. They want to dress up as superheroes. Even my older boys sometimes still put on their old dress ups. The SPESS Superhero Capes are super! 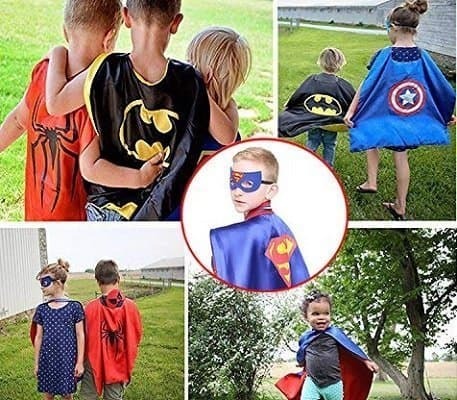 The capes are made of double-sided satin, and they have a velcro closure in the front. Each of the superhero capes comes with a matching mask. The capes and masks are high-quality, and they are surprisingly inexpensive. Each cape has the logo screen printed onto it. That means the logo won’t peel or rub off, which can be a problem with cheaper dress up clothes. There are different options with these capes at slightly different prices. 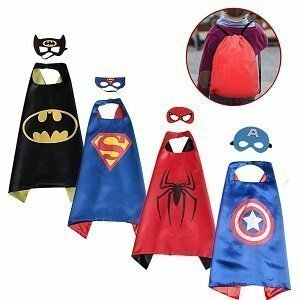 With the set of 4 capes/masks you get Batman, Superman, Spider-Man, and Captain America. The set of 5 capes/masks includes the same as in the set of 4 plus Captain Marvel. This play workbench with realistic tools is a high-quality toy that was built to last. It’s also such a fun toy for boys who like to imitate their parents. With 12 play tools and a total of 68 pieces (including nuts, screws, and hooks to hang the tools), this workbench is sure to keep your boy busy and happy. Nearly all of the tools in this set actually function. 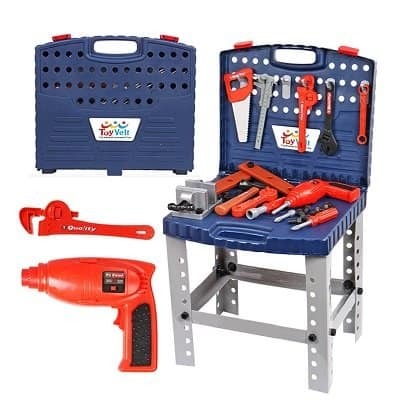 The screwdriver can drive the included plastic screws, the hammer can drive nails, the wrench tightens bolts, and the battery-powered drill works as well. The saw does not work, however, which is a good thing. The workbench itself is lightweight but sturdy. When it first arrives, there is some minor assembly required but nothing that takes more than a few minutes. The 2 AA batteries required to operate the drill are included in this set. Your boy will enjoy using his imagination to build projects with this fun toy workbench! 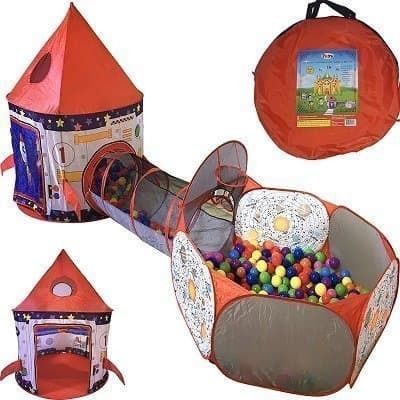 Expand your child’s imagination with this fantastic play rocket ship, tunnel, and ball pit. The pieces connect to create a large play area that will keep your child busy for hours. Or the sections can each be used separately if space is an issue. Use this toy either indoors or outdoors, though be careful if it’s windy. 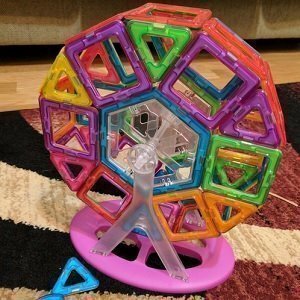 When the pieces are connected, this toy does require a lot of space. It comes in a zippered bag, and when not in use, all the pieces collapse and can be put back into the bag. Set up is easy and fast, and all needed pieces are included. However, no balls are included for the ball pit. You can use this toy without the balls. If you choose to purchase balls, you will need at least 400 balls to give a couple layers in the ball pit. Instead of balls, your child could play with stuffed animals or other toys in the ball pit. The rocket ship play tent looks like a rocket ship. Buttons, knobs, vents, and controls are printed on the inside walls. A basketball hoop in the ball pit provides even more fun.